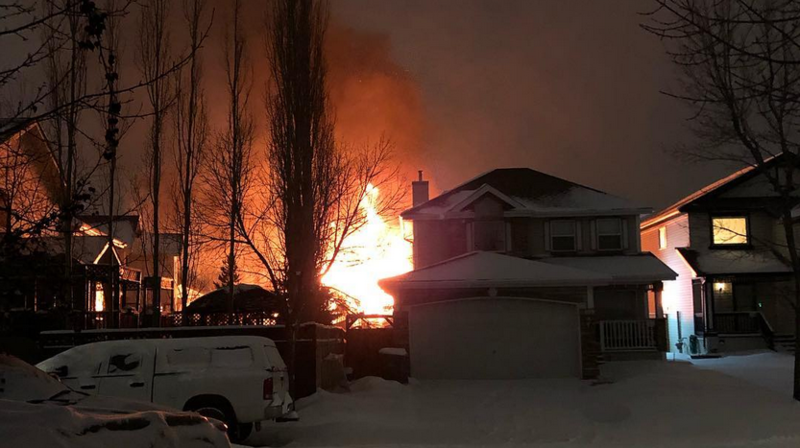 Residents of a Calgary neighbourhood were awakened by a house explosion early on Sunday morning. It’s not yet known what caused the fiery blast or whether anyone was inside the home. Diane Bender, who lives a few doors down, says she and her husband were jolted awake at around 4 a.m. by a loud bang and items falling off their walls. “I literally thought I was having a heart attack,” she told CTV Calgary. Jim Bladon told CTV News Channel that he and his son were also awakened by the sound. 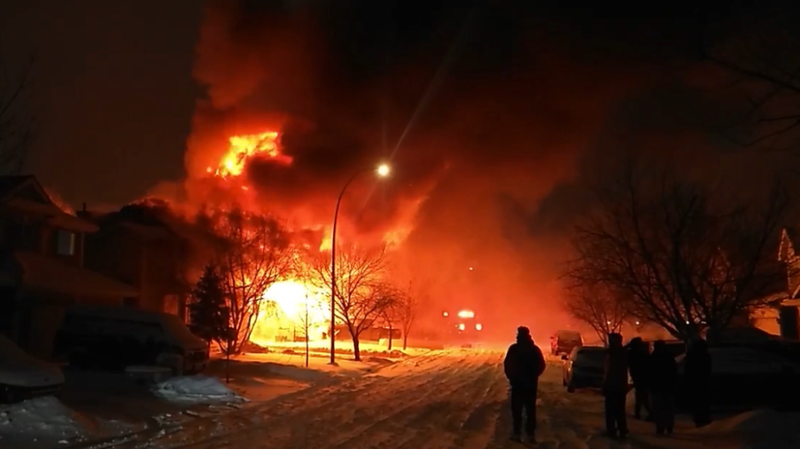 Calgary fire spokesperson Carol Henke said police received 25 calls about incident that happened at around 4:22 a.m. MST. Some calls came from as far as several blocks away from the house. 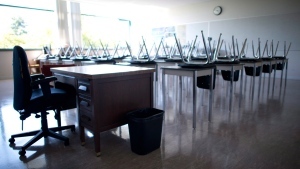 “It woke everyone in the neighbouring area. Even people that didn’t have a line of sight of the house heard it, felt it and called 911,” Henke told CTV News Channel. Two fire crews arrived to find one house was engulfed in flames, with fire spreading to three neighbouring houses in total. Neighbouring homes’ windows were broken and gutters were hanging from trees. “We really, really hope not to find anyone inside the home – that would be the ultimate tragedy with an incident like this,” Henke said. “But again, until it’s safe for fire crews to go inside to do a search of the home, we just don’t know at this point,” she added. As of Sunday evening, firefighters were still dousing hotspots. They had received no reports of anyone missing but planned to search the property as soon as it was safe. Neighbours told CTV Calgary that the owner of the home is believed to be in Thailand. They said the house was recently rented out to a man but he hasn’t been seen for weeks. 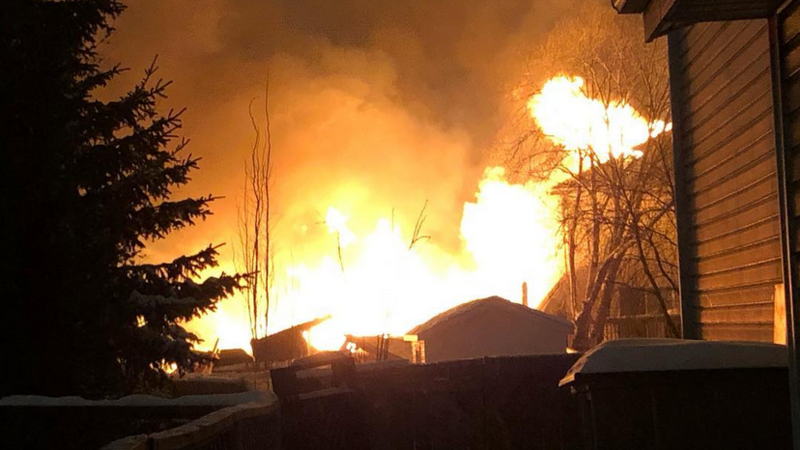 District fire chief Innes Fraser said that a second home was so badly damaged by the fire that it will likely need to come down but residents of the other homes were safe to return.